Luyanó residents the day after the tornado, which ravished that Havana neighborhood. Taken by the independent journalist Yosmany Mayeta for Cubanet. Iván García, 2 February 2019 — “An organized society, a planned economy, a socialist government, will always have reserves so that no one is left homeless,” President Miguel Diaz-Canel wrote in his Twitter account. Nobody in Cuba is left homeless after a natural catastrophe, tragic accident or serious illness, said Fidel and Raul Castro in the almost six decades that held power. The reality is very different. For example, there are hundreds of Cubans who lost their homes or were seriously damaged by hurricanes that have hit the island in the last seven years and are still waiting for repairs or to be given a home. In Havana, dozens of families, also affected by cyclones, have been housed for more than twenty years, waiting for someone to remember them and provide them with an apartment or a house to live in with dignity. According to specialists in meteorology, the tornado that hit the capital at 8:30 on Sunday night, January 27, was formed in the Casino Deportivo neighborhood, located on the border of the Cerro and Diez de Octubre municipalities and extended to Regla, Guanabacoa, San Miguel del Padrón and Habana del Este. The warehouses, workshops and the José Antonio Echevarría wheat mill were hit by the fury of the tornado winds that in 16 minutes traveled eleven kilometers and crossed five municipalities of Havana. The grass in that industrial zone looks like it was burned by a powerful blowtorch. The meteorological phenomenon had a radius of from 500 meters to a kilometer in its exit to the sea. Its winds between 275 and 320 kilometers per hour devastated what was in its way. “Terrible, worse than a hurricane. In the area of the Paradero de la Víbora did no damage, but nearby towns such as Santos Suárez and Luyanó were destroyed. It seemed that the mother of all the bombs had fallen to us, recalls Rogelio, a meter reader who lives in Luyanó. In the affected areas, the government began selling bags of cookies, food and some canned goods. In the newspaper Granma, it was announced that the Union of Commerce and Gastronomy of Havana set up 17 tents for the sale of prepared processed foods, in the municipalities Diez de Octubre (eight tents), Regla (four), Guanabacoa (three) and San Miguel del Padrón (two). “If you are careless, that is all that they will give to the victims in terms of food. Luckily the tornado did not cause damage in our humble home, “says Carlos Manuel, retired. Osvaldo, an accountant for a textile company, affirms that “these people (the regime) have to understand that most people do not have a penny. No one is to blame for that disaster. The best they can do is donate or give away those things. They say that along the Calzada de Luyanó they saw some pinchos (leaders), as fat as pigs, but where I live, no one has come by. With immediacy, Diaz-Canel on a Twitter announced that three people had died and 172 were injured. Later it was learned that there were four deaths and the number of injured had increased to 195, although unofficially it is rumored that the injured exceed 300, some in serious condition. “When the Boeing plane crashed, in May of 2018, they immediately gave the names of the passengers, Cubans and foreigners, but now it took four days to give the names of the four deceased, one woman and three men,” says Laura, retired. According to official figures, 1,238 homes suffered property damage, 123 totally collapsed. There were 625 partial collapses, 224 roofs damaged, 154 partially. Of the damaged homes 112 are of type 1, that is to say with tile roofs, which are rarely affected. The most affected neighborhoods are those of Regla, Diez de Octubre, Guanabacoa and San Miguel, where the powerful EF4 tornado passed, which, in addition to damaging housing, caused considerable damage to public health facilities, such as the Maternity University Hospital of Ten de Octubre, better known as Daughters of Galicia, four polyclinics, a pharmacy and a nursing home. The authorities reported that more than 100 thousand people do not have electricity, but they have not presented an evaluation of the cost of the losses in state assets. Dalia, economist, believes that “damages to companies and institutions of the State, in a superficial calculation, can exceed 600 million dollars. To this we must add the containers of goods that were damaged and part of their cargo was stolen, something that the press has not reported. Fifty state transportation vehicles suffered some kind of damage.” Even less is known about the damage and losses suffered by private entrepreneurs who had businesses in the four municipalities where the tornado passed. While the State continues with its mottos and slogans and slowly prepares to help the victims and assess the amount of damages, musicians and artists are visiting affected neighborhoods and making donations from their own pockets. Under the motto Fuerza Habana (Havana Strong), individual and collective campaigns were activated on Monday, January 28. By personal initiative, they have brought food to the affected areas. The singer Haydée Milanés uploaded a video to her Twitter from one of the affected sites and asked those who were willing to help, to do so. Periodismo de Barrio tweeted that the duo of Yomil and El Dany, plus Diván and Alex Duvall, in addition to the rocker Athanay, distributed water jugs, soft drinks and other products in Jesús del Monte, Luyanó. The actor Andy Vázquez, of the Vivir del Cuento TV program, toured affected areas and comedian Ulises Torac wrote that “there are people without homes walking around asking for votes,” a reference to the government mobilizing hundreds of university students and soldiers to touring the devastated areas wearing shirts with the slogan “I’m Voting Yes,” on the February 24 Constitutional Referendum. Spanish singer Alejandro Sanz and Cuban actor Luis Alberto García appealed for solidarity so that all humanitarian aid from abroad can reach Cuba for the victims of the tornado that hit Havana, free of restrictions and customs duties. The reggaetonist Osmani García went to Díaz-Canel and told him that, “like other global artists, we are spokespersons and ambassadors of our people throughout the world. For some time, Cubans living on the island have considered that the government should decree a customs moratorium and free of cost, deliver the packages coming from abroad. “They talk about human rights without blushing their faces, but they charge dearly for the family help packages that come from outside. A few days ago, my daughter-in-law who lives in Europe, sent clothes and some gifts for my daughter’s birthday and to receive the box, which weighed little more than 4 kilos, I had to pay 50 cuc [roughly $50 US]. It is an abuse. “Because of the anguished situation that so many people are living through, in Havana because of the tornado, but also in the rest of the country, where there are still families affected by floods and the passage of hurricanes, they should authorize the sending of packages at no cost to the recipients. Three months ago, milk powder was impossible to get in Havana, not to mention the scarcity of bread and eggs, among other products,” complains Marta, a housewife. Despite the campaign that emerged on social networks (and which have been echoed by Florida media and independent Cuban sites), calling for a humanitarian aid channel to be opened, to date, the regime has only opened a bank account in pesos and another in convertible currency for those people who want to help. In a country of excessive control, only the State has the green light to receive and distribute humanitarian aid. They do not even permit stipulations on how and where the donations are distributed. It is the intrinsic nature of a totalitarian system. The individual and spontaneous initiatives sound like an enemy plot against the Castro regime. Lázaro Javier Ruiz Varela, 23 years old, from Mayabeque and resident of Cintra No. 55 between Empresa and Reyes, Cerro, Havana. Cause: When the bus in which he was traveling overturned, he suffered a fracture of the base and vault of the skull, with severe brain contusion, causing injury to upper nervous centers. María Esther Linares Deroncelé, 56 years old, from Santiago de Cuba and resident of Calle H No. 26 between Adolfo del Castillo and Final, Guanabacoa, Havana. The collapse of the roof of her house caused severe thoracic-abdominal compression, causing acute anemia. Juan Francisco Cuesta Kessel, 79 years old, native of Havana and resident of Calle 377 No. 17823 Apt. 10 between 178 and 184, Mulgoba Neighborhood, Boyeros, Havana. The collapse of the roof of his house caused him chest and abdominal compression, causing him to suffocate. Ronner Hernández Caso, 42 years old, from Pinar del Río and resident of 3rd Avenue. No. 1410 between 14 and 16, Caraballo, Jaruco, Mayabeque. The bus in which he was traveling overturned, causing an acute subdural fracture and subarachnoid hemorrhage that caused him intracranial hypertension. He was operated on, but died. In that list, released by Civil Defense and published in the Granma newspaper on January 31, does not include the case of a 13-year-old teenager who died from electrocution by a high voltage cable, while helping a neighbor in Mangos Street No. 133, Santos Suárez, Havana. Note: On Friday, February 1, Cubanet reported that in a video posted on social networks showing residents chasing after an official delegation headed by President Miguel Díaz-Canel shouting “shameless,” The official delegated ran and hurriedly got into their vehicles. 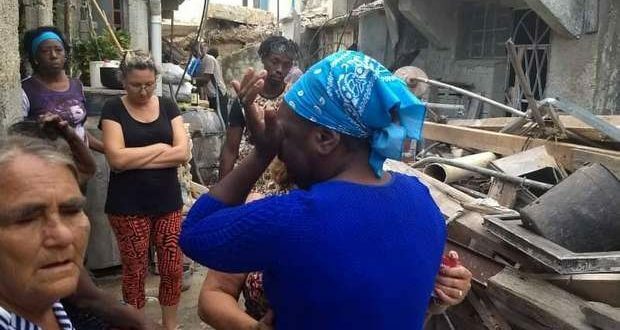 This happened in Regla, one of the localities most affected by the passage of the 300 km/h tornado that hit Havana on the night of Sunday, January 27. Three of the four dead and at least 50 of the injured are from Regla. Next Next post: Lazaro Bruzon Wants "Cuban Sports to be Divorced from Politics"